The latter half of the 1800’s saw an explosion of railways across Canada, due to the unprecedented support of both the federal, and provincial government at the time. Although Listowel received their railway later than others, almost as a kind of aftershock of the initial railway explosion, it was certainly met with no less enthusiasm in the local paper, The Listowel Banner. This article will trace the development of the railway in Listowel, along with the communities reactions to the ups and downs of building a railroad, as told through the voice of the local paper. Beginning in the 1860’s, Listowel began to capture the interest of two prominent railway companies, the Toronto, Grey & Bruce (T.G.& B), who wished to build a line to Guelph through Stratford, and the Wellington, Grey, & Bruce (W.G. & B) who intended to build a southern extension to their rail line that would pass through Listowel on the way to Kincardine. The latter half of 1868 saw many discussions over the merits of each line, however, the prevailing sentiment seems to have been that any railway coming through Listowel would be fantastic for local economy, and thus, should be heavily encouraged. In the mean time, the Banner expressed hope that their “village [would] go on and prosper… [so] that they do not give us the go-by”1. Being by-passed by the railway was a real fear for smaller communities such as Listowel, much in the same way that many smaller towns today have been made increasingly irrelevant through the continued development of major highways that discourage people from stopping and shopping in rural areas. In the 1860’s, having a railway gave your town the best chance of flourishing. The economic benefits that a railway could provide to a town in Listowel’s position can not be overstated. The Banner wrote that the existence of a railway line in their area would “increase the value of these lands from $4 an acre to $15”2, allegedly tripling the value of property near the proposed railway. This type of economic development would be well worth the donations, or “bonuses”, that the railway companies were asking for in order to help them build extensions to their rail lines. Within two years of the initial “rival railways” newspaper column, the W.G. 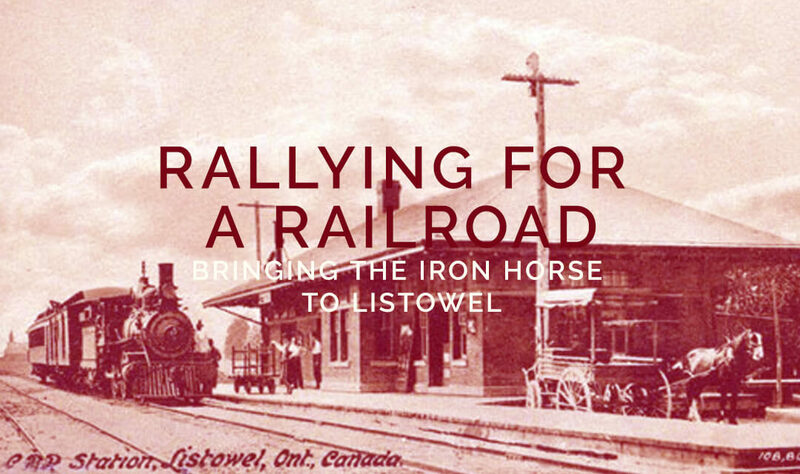 & B had emerged as the clear front-runners for being the company to bring the iron horse to Listowel, and thus, the towns attention turned fully towards them. The Banner wrote that “the object in view, is to endeavor to get the W.G. & B. to form an extension to Kincardine by way of Listowel”3. They would not have to wait long for events to be set in motion. Within a week, the directors of W G. & B. stated that they would construct the Southern Extension towards Kincardine, as soon as they received “a bonus of $16,000 per mile […] [to be] granted by the municipalities”4 in order to help them construct the track. The ‘bonusing” phenomenon was very prevalent during this time of booming railway construction, not only at the municipal level, but at the provincial and federal level as well. For example, the Attorney General of Canada was said to be willing to “introduce […] his promised resolutions, providing that a certain portion of the surplus funds […] shall be expended in aiding the construction of railways”5. A quote such as this shows the importance of the railway to the country as a whole as at the time it seemed as though it was the key to prosperity for all nations. Listowel is one example of many taking place at the time, of communities rallying together alongside the higher levels of government in order to make life as easy as possible for railway companies to develop in their area. A decision that was not always the most financially prudent choice, as would be seen further down the line at the national level. The aforementioned issue of offering bonuses to railway companies did not seem to be much of an issue for Listowel. In fact, the only time a dissenting opinion is noted is when it is systematically “debunked” and discarded6. For the majority then, it seems as though funding the railroads was a forgone conclusion. Perhaps noting the strong level of grassroots support they had, the W. G. & B., as of May 1867, were said to have committed, albeit unofficially to the project, and had sent the first round of engineers to Listowel to survey the area7. “This announcement was received with demonstrations of satisfaction by the crowd of people who gathered around Mr. Hay when the telegram [confirming the extension] was read. The suspense that has hung over our destiny for months past is thus in a great measure removed, and the question of having the line built is now in the hands of ratepayers”9. Now that the W. G. & B had officially begin the construction of the Southern Extension line to Listowel and Kincardine, meetings discussing the railway bonuses could begin in earnest. In the following weeks edition of the Banner, it was noted that meetings had finally begun to discuss the financial contribution to the railway that would be forthcoming from the municipality10. 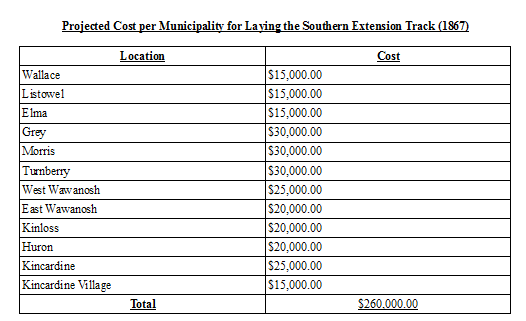 Alongside this, an updated list of bonus amounts necessary from each municipality was released, in general the projected cost to municipalities fell, although Listowel’s contribution of $15,000 was to remain the same. Within two months of the initial meeting discussing railway funding, by-laws were passed in Listowel granting the W. G. & B the bonuses they so desperately needed11. At this point in time, the Southern Extension track had been laid as far as Harriston, and things were looking optimistic for everyone involved in the process. Construction towards Listowel began during the week of December 14, 1871, and with it, it seems as though the town began to develop a touch of arrogance in its dealings with other railway companies. Whereas before it had been confirmed that the railroad would for sure be coming to Listowel, there was a tone of anxiety throughout the paper, now there was sense of aloofness when discussing railroad matters. For example, the editor of the Banner, wrote, on the prospect of another railway coming to the town that, “we might possibly be induced to commit bigamy by also uniting our fortunes with one of them”12. As the construction of the railroad would continue to wear on, this tone would soon change. In April of 1872, an announcement was made in the paper stating that the Southern Extension, as far as Listowel, would be fully operational by October of that year, and that construction on the station itself would begin in July13. The construction team was said to have consisted of “200 men and 50 teams of horses working on line between Palmerston and Listowel”14. Such a sizable team would hopefully ensure that the railway met its goal of an October opening. 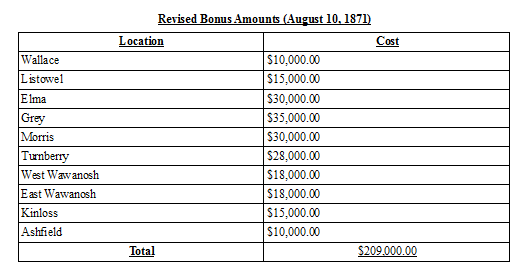 The size of the team also shows that the large bonuses given to the railroads were also benefiting the local economy, through employing hundreds of people that may not have been able to find work elsewhere. In order for this team of workers to be effective, however, they would need supplies. In September it was said that the iron that was needed for laying tracks to Listowel had arrived in Palmerston, and that track laying would soon commence. However, two short months from then, talk of delays, and angry merchants who were depending on the timely construction of the railway, would dominate newspaper coverage, with some businesses threatening to divert their shipments through Mitchell if construction did not pick up15. The situation seemed to only get worse. The following week the contractor in charge of laying the track was forced to dismiss his men, as they had run out of iron16. This announcement, while seeming rather dire, did not seem to make much of an impact on the overall project, as within two weeks the grand opening of the railroad was announced to be on Thursday, December 5, 1872, and that “arrangements […] [were] being made to have a gala day”17. It is at this point that the records of the Listowel Banner go dark for approximately four years. Unfortunately, without the newspaper coverage it is impossible to document the reaction the community had following the opening of this project that had been discussed for so long. However, the records that are available to us show the importance that railways had on the both the economic development, and the sense of community pride within towns such as Listowel, and thus, we can at least hazard the guess that the town was pleased with all the money and work that went into its construction, at least until the Highway Age began. 1 – “The Rival Railways,” The Listowel Banner, 24 Sept. 1868, 2. 2 – “The Railway,” The Listowel Banner, 16 Feb. 1871, 2. 3 – “Railway Matters,” The Listowel Banner, 19 Jan. 1871, 2. 4 – “Railway Extension,” The Listowel Banner, 26 Jan. 1871, 2. 5 – “The Surplus – Aid To Railways,” The Listowel Banner, 9 Feb. 1871, 2. 6 – “Kincardine Extension,” The Listowel Banner, 1 Jun. 1871, 2. 7 – “The Kincardine Railway,” The Listowel Banner, 25 May. 1871, 2. 8 – “Listowel And Ainleyville Route Adopted,” The Listowel Banner, 29 Jun. 1871, 2..
10 – “Railway Matters,” The Listowel Banner, 6 July. 1871, 2. 11 – “Railway Items,” The Listowel Banner, 28 Sept. 1871, 2. 12 – “The Railway Mania,” The Listowel Banner, 21 Mar. 1872, 2. 13 – “The Railway,” The Listowel Banner, 25 Apr. 1872, 2. 14 – “The Southern Extension of the W. G. & B. Railway,” The Listowel Banner, 13 Jun. 1872, 2. 15 – “W.G. & B. Southern Extension,” The Listowel Banner, 14 Nov. 1872, 2. 16 – “Our Railway,” The Listowel Banner, 21 Nov. 1872, 2. 17 – “Opening of the Railway,” The Listowel Banner, 5 Dec. 1872, 2.